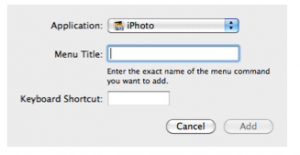 Most options in the menus of Mac OS X applications can be activated with keyboard shortcuts. 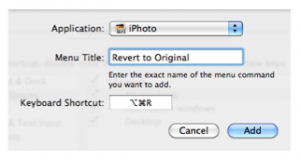 Every once in a while, you may come across an option that does not have a keyboard shortcut assigned to it. This tutorial will show you how to create your own shortcuts. Choose Apple, System Preferences, Keyboard. Make sure you’re in the Keyboard Shortcuts pane and select the Add (+) button on the right side of the window. Choose the application where the keyboard shortcut will be used from the menu at the top of the popup window. Enter the name of the menu command exactly as it appears in the application you selected in step 3. Choose a shortcut by typing it into the Shortcut text box, then choose Add. The Keyboard Shortcuts pane is also where you can change existing shortcuts. 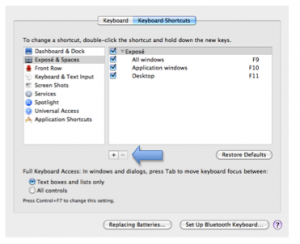 To change a shortcut, double-click the existing shortcut and enter new shortcut keys.